Scott Walker at Walker Corporate Law. Scott loves startups and shows it, with fixed-fee pricing. Have a question? Email him directly at scott@walkercorporatelaw.com and tell him Jason sent you. At STHLM TECH FEST Jason sits down with Skype and Atomico Founder Niklas Zennstrom and Klarna Founder Sebastian Siemiatkowski. 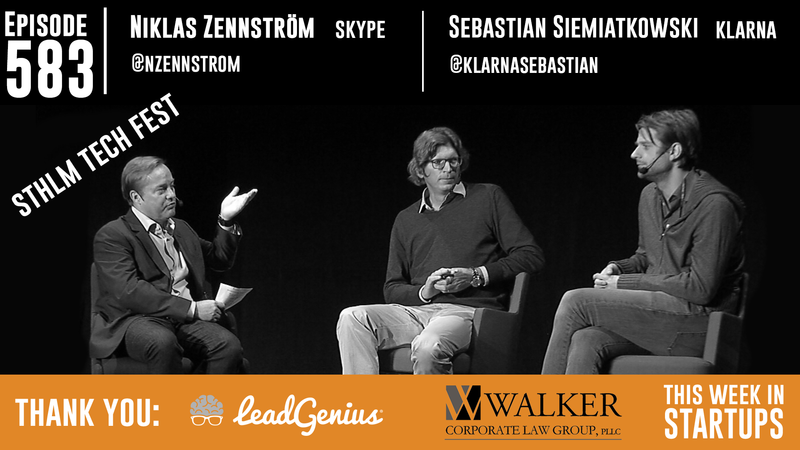 An amazing conversation spanning: Stockholm v. Silicon Valley breakdown as the best place to start your company, how Niklas came to invest in now-unicorn Klarna, how Sebastian got the #1 VC (Mike Moritz) to not only invest but also join the Board, Niklas’ experiences being sued for billions by the music labels over his co. Kazaa in the early 2000’s, how the idea for creating Skype came about, why Niklas decided to sell Skype for $8.5b to Microsoft (and if he regrets selling), how Niklas’s $450m VC fund Atomico provides more value than just money (hint: international growth), how the Stockholm startup ecosystem is booming and has the most unicorns of anywhere in the world per capita, the increasingly urgent topic of immigration — and much more.